If you can’t jump on a plane right now to go eat the most gorgeous and delicious pastries in the world, you can plan ahead by following the Instagrams of these pastry chefs who create desserts that are actually Everything. Here’s our collection of the most knock-out dessert Instagrams in the world. These iG’s are packed with photos of the best desserts and only the best desserts. If the iG had more photos of the chef smiling into the camera than pastries, more photos of the bakery space than the pastries, or more chocolates or bread than pastries, they didn’t make the cut. And even beyond that, to be included here the pastries had to have that indefinable thing of being terribly chic. In other words: Sorry, brownies and apple pie, but not sorry, we want eye candy and we want it now. Cedric Grolet is one of the most creative pastry chefs in the world. He started cooking at the age of 12 and now is pastry chef at the luxury hotel Le Meurice in Paris. Cordon Bleu calls him “a young pastry prodigy.” His desserts are above and beyond — both beautiful and startling. Grolet proves the famous quote from Careme to be true: “The Fine Arts are five in number: Painting, Music, Poetry, Sculpture and Architecture — whereof the principle branch is Confectionery,” but with the added note that modernist architecture surely plays a part in his inspiration. Paris is currently a pastry lover's dream. This shop with a view of Notre Dame makes small works of art with a precise beauty that can't help but delight. It may be cliché to say “They are too pretty to eat,” but that just happens to be true when considering these pastries. In addition, they are made with natural flavors – no added aromas or extracts – which proves that Chef Arnaud Lecroix is a truly dedicated and very talented professional. This curated collection of pastries from the world's best pastry makers brings photos of the truly drool-worthy into your feed. Pastry Elite's motto is that it's “by pastry chefs for pastry chefs” and the photos do a great job of showing the incredible range of techniques pastry makers use to create small sweet miracles. Is cotton candy actually “pastry”? If you want to be precise, no, it's not. It's actually considered to be in the candy family. Nevertheless, cotton candy (or “candy floss” as it's also called) is being used in new ways, stretching out with new flavors, new uses and new ideas on how it can be eaten. Plus it's always good to think outside the box! This curated collection of finessed pastries is elegantly put together by a pastry chef who takes photos of them along with his shoes, and he always wears nice shoes. There are some unusual pastry designs to be found on this page — Tal Spiegel has a good eye for pastries not easy to find elsewhere. Café Pouchkine has several locations in Paris and one location in London. The original tea shop and café are in Moscow, and many of the pastries are designed with a certain aspect of Russian design. Pastries shaped as old books, or with gilding in unexpected places, or cakes resembling Russian church domes, or even luxury handbags resplendent in red velvet — these pastries are truly amazing. Dina Rakasko is a pastry chef and teacher in the Ukraine with incredibly creative designs on her iG. Shiny architectural hearts, cloudy pouffs of cakes, triangular concoctions that seem to have come from a place like Charlie's Chocolate Factory — but more, and better, and wilder, and much, much more sophisticated. Silikomart Professional is a company that makes cake and pastry molds for professional pastry chefs. Here they've selected the work of the finest professionals in pastry to demonstrate the vast creativity that's possible when you've got a great pastry mold and a great mind to put to use with some great sweet ingredients. “Doughnuts?” you say. “I thought you said you only included the terribly chic?” you say. Check it out. These doughnuts are terribly chic. 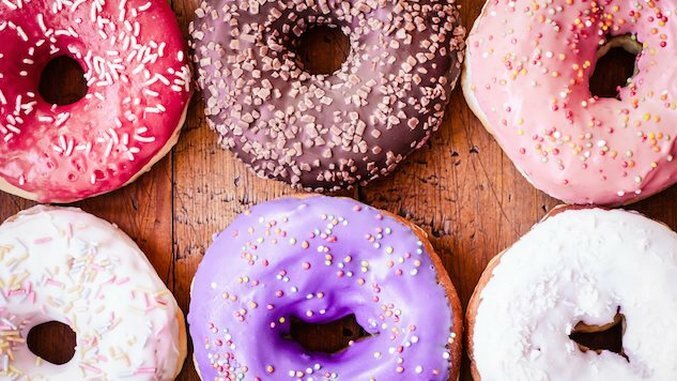 And please note that this iG distinctly separates their work from the others who may take photos of doughnuts from the side or from any other angle. Doughnuts, from the top, are the best. Kiev International Culinary Academy is rocking out with this iG page. There's something very right about their way of doing “French pastry education in Eastern Europe.” This feed will keep you pretty much ahead of the curve in terms of knowing where pastry making currently is, and where it's going to go. Chef Bertrand is a Meilleur Ouvrier de France, which may sound like a stuffy title to have, but I've met a few of these guys in my life, and at least in my experience, they are actually pretty nice. But what the title says is that these guys really know their stuff. Sheer beauty, in pastry form, is what it's all about. Fou de Patisserie is a shop in Paris you can visit. This is their iG account, which will make you rush to book plane tickets to get there asap. These mouthwatering pastries remind me of magical gardens, and even if there are calories involved it really doesn’t matter because it’s definitely more than worth it.